By 2020, the number of people in the world aged 60 and older is projected to outnumber people younger than 5. How to care for the elderly is one of the issues that will need to be addressed by the international community. According to the Annual Health Bulletin, the life expectancy at birth in Bhutan increased from 45.6 years in 1980-1985 to 68.9 years in 2010, and the percentage of people in the population aged 60 or over reached 7.3%. In 2010, the Ministry of Health of Royal Government of Bhutan initiated a program of “community-based medical care for the elderly,” which attempts to empower communities to take care of their elderly. However, according to the 2017 Population & Housing Census of Bhutan, rural-urban migration is becoming increasingly common within the country. Most districts in the west of the country have experienced population gains from positive net migration, while districts in the east are losing population. As migration is mostly a young cohort phenomenon, a significant number of the elderly may be left behind in the rural districts. This academic seminar looks at the challenges of health and rural development in the communities of Bhutan, and explores future possibilities for the region. The speakers in this seminar will share significant issues and concerns relating to health and rural development based on the concept of Gross National Happiness. The participants may have much to learn from the strategy and experiences of Bhutan. The seminar includes a field trip within Bhutan. 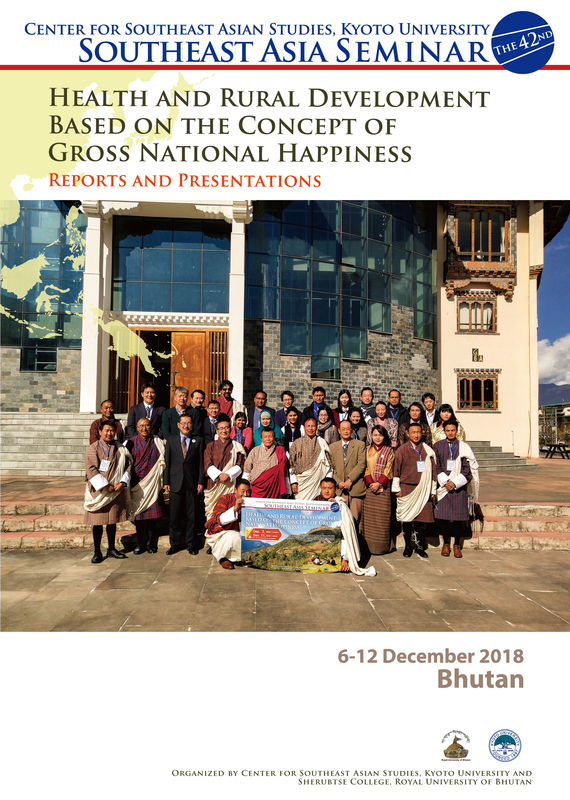 From December 6th to 12th, 2018, Royal University of Bhutan (RUB) and Kyoto University jointly organized the 42nd Southeast Asia Seminar “Health and Rural Development based on the concept of Gross National Happiness”. The academic seminar looked at the challenges of health and rural development in the communities of Bhutan, and explores the future possibility in the region. The participants consists of scholars from 12 different countries including Bhutan, India, Sri Lanka, Myanmar, Thailand, Laos, Cambodia, Malaysia, Philippine, Indonesia, Vietnam, and Japan. At a conference at Office of the Vice Chancellor, RUB, Thimphu, Dasho Pema Thinley, Former Vice Chancellor of RUB, Dasho Nidup Dorji, Vice Chancellor of RUB, Dasho Karma Yeshey, Secretary, Ministry of Education, Dasho Ugen Dophu, Secretary, Ministry of Health, Mr. Koji Yamada, Representative, JICA Bhutan Office, Ms. Dechen Pelmo, and Sr. Planning Officer, Gross National Happiness Commission gave presentations according to the theme of the seminar. After the conference, the participants conducted field trips to Thinleygang and Samtengang to find out the nature of My Gakidh Village, Basic Health Unit, and Outreach Clinic. At the end, the participants shared their perspectives in a workshop at College of Natural Resources, Lobesa. Visit an Outreach Clinic (ORC) near Samtegang BHU. Participants will prepare for the workshop on the next day. Participants will arrive in Thimphu, Bhutan on December 6th and depart for their respective country of residence on December 12, 2018. Applicants who want to join the seminar must have a strong academic interest in the topic of this year’s seminar, and should be prepared to participate actively and constructively, and join in discussions for the full seven-day tour. We accept applications from young and up-and-coming scholars in Southeast Asia, East Asia, and other regions. Nationality balance will be taken into consideration while selecting participants. Registration is free. Airfare of Druk Air or Bhutan Airlines, and accommodation will be covered by the organizers. The seminar committee will select on the basis of the application forms, and only accepted applicants will be informed by the end of October, 2018. The Southeast Asia seminar has been held annually by the Center for Southeast Asian Studies, Kyoto University since 1977. Aiming to deepen the understanding of Southeast Asia from various perspectives, the seminar offers seven days of study tour in Bhutan, together with presentations and group discussion by the participants. This year, the seminar will be held in Thimphu, Bhutan, co-organized by Royal University of Bhutan.